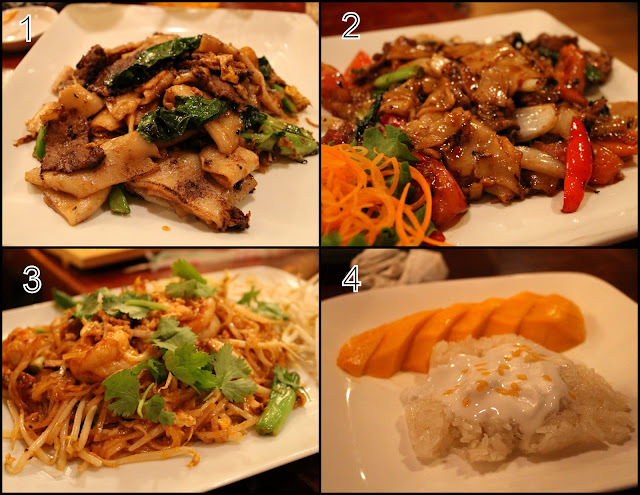 When my Thai friends recommend a Thai restaurant, I need to trust their judgment pronto! Nava Thai is located in my old neighborhood. I grew up on Arcola Ave, and my mom had a hair salon across University Blvd. There's street parking and a small lot 1/2 block down. The closest metro stop is Wheaton on the red line. The interior looks like a converted house, which gives it a relaxed vibe, but the ornate Thai decorations make it look much nicer. Even though I'm trying to cut back on sugar (it never happens), I ordered a Thai Iced Tea ($2.50) and the bf ordered a Thai Iced Coffee ($2.50). Look at the cute cups they used! The server said they are from Thailand. They were delicious and a great price. They have a huge menu! They have 80 Thai dishes and 91 Japanese items (includes rolls). Good luck deciding what to eat! They all sound awesome. I came with a group of 7, but I'm only documenting items the bf, cousin and I ordered. They all happen to be very popular noodle dishes and a dessert. 1. Pad See Ew (ผัดซีิ้อิ้ว) Stir fried rice noodle w/ Chinese broccoli in bean sauce and choice of meat ($9.95). I ordered it with beef, and I'm salivating as I type. The noodles had so much flavor! Plus the char from cooking added a nice smoky flavor. 2. Drunken Noodles – Pad Kee Mao (เกี๋ยวเตี๋ยวขี้เมา) Stir fried rice noodle w/ veggies & hot pepper, and choice of meat ($9.95). The bf ordered beef and found the two chili pepper symbol not too spicy. He thought it was good, but liked my Pad See Ew a little better. 3. Pad Thai (ผัดไทย) - Famous Thai noodles w/ egg, shrimp, bean sprouts, green onions & crushed peanuts ($9.95). The cousin ordered this, and though it had more of a fish sauce flavor rather than peanuts, it was still very yummy. 4. Mango and Sticky Rice ($4.50). The rice was sweet and the mangoes were ripe. Great way to end a meal. I actually can't wait to go back and try other dishes. I was able to sample my other friends' and everything was flavorful. The service was great! They were so friendly. helpful and attentive. I found the prices to be very reasonable too. 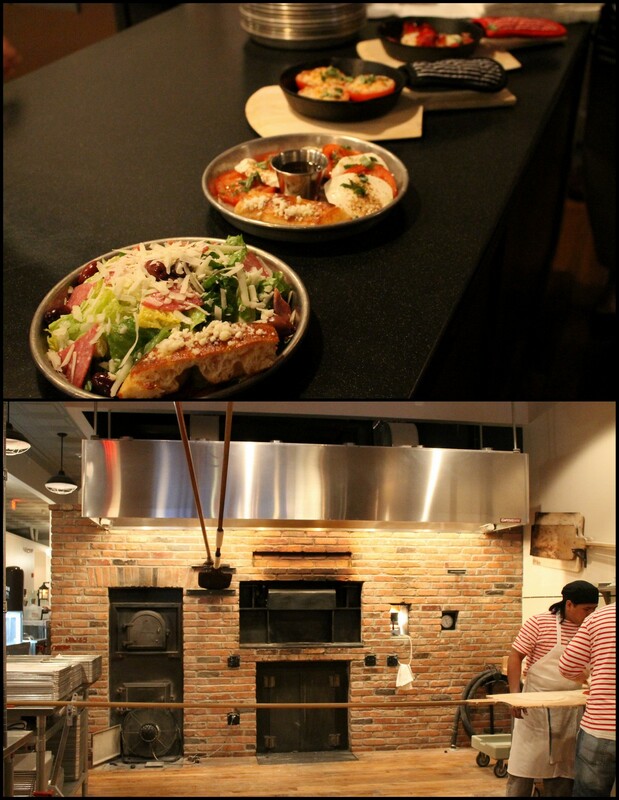 Bethesda has a new pizza place - Haven Pizzaria Napoletana! The bf and I were invited to check out what makes their pizza different. The their bar has a gorgeous wine display and their casual, yet upscale decor fits for families, business lunches and dates. Other than pizza, their menu consists of Starters: Arugula Salad, Romano Salad, Haven Arance Salad and Have Potato Chip. The ovens are 'one of a kind'! They have two 1000lb ovens that are 12x12 ft wide and completely coal operated. This picture doesn't do it justice, but they are huge! I wonder how many times people have tripped over or got hit with the pizza peels. 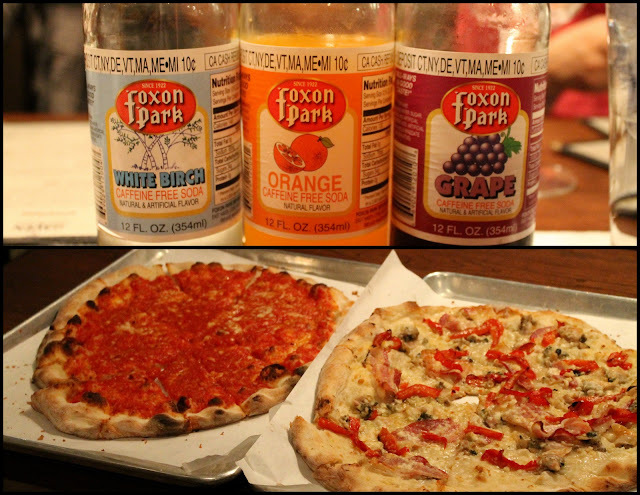 We washed down our meal with Foxen Park Sodas that are very poplar in Haven, CT. 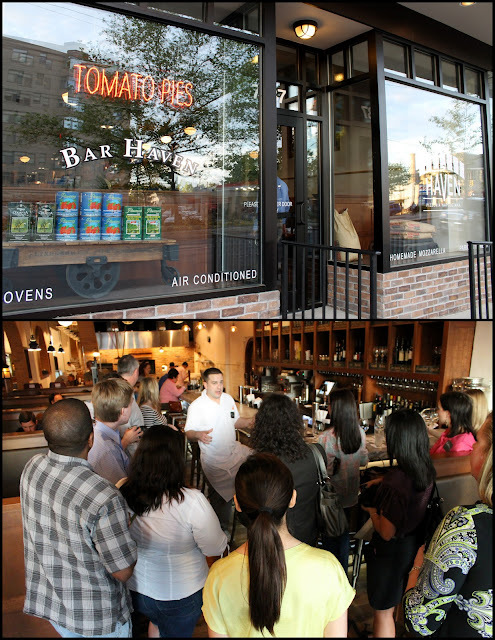 The we tried many of their pizzas but shown below are the Tomato Pie and Haven White Clam Pie (my favorite!). The char on the bottom of the pizza gives it a nice flavor and the dough has a nice chew to it. I don't know if you can see how they slice the pizza, but it's cut into 4ths, then each 4th is cut into 3rds diagonally. This is to prevent one from folding it like a NY-Style slice. Cool, huh? 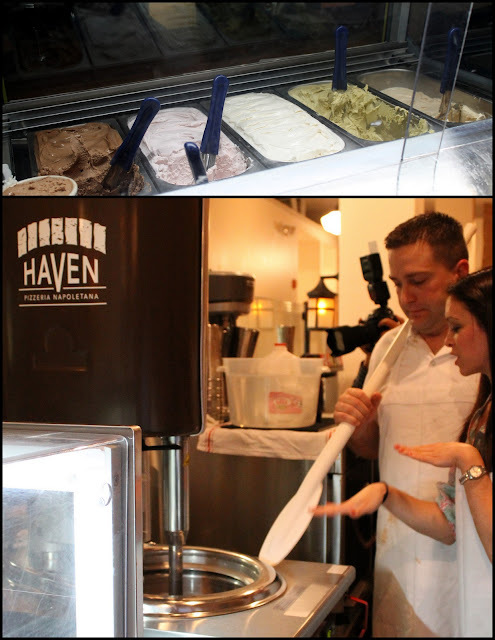 They also make their gelato in-house daily in their Italian batch freezer! It's half the fat of ice cream and have a smooth silky texture. My beautiful, selfless friend, and fellow food blogger Michele from Squirrels-n-Sweets is participating in the Susan G. Komen 3-Day AKA she's walking 60 miles in 3 days (crazy!!) to raise money for breast cancer research. Come support her event! 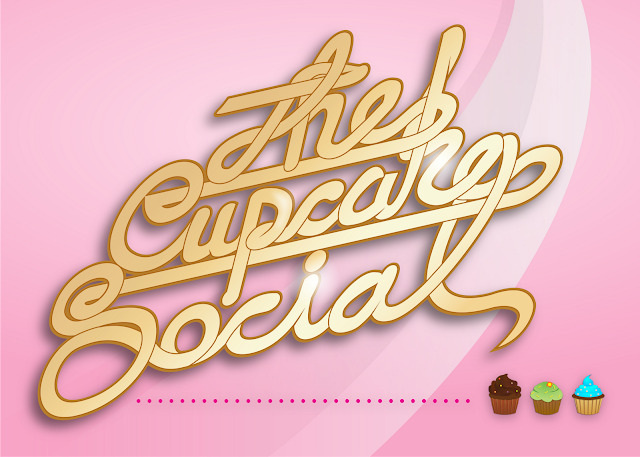 Read below what sparked the creation of The Cupcake Social. This girl has a heart of gold. If you are a bakery or blogger that would like donate cupcakes, hit us up! The more the merrier! 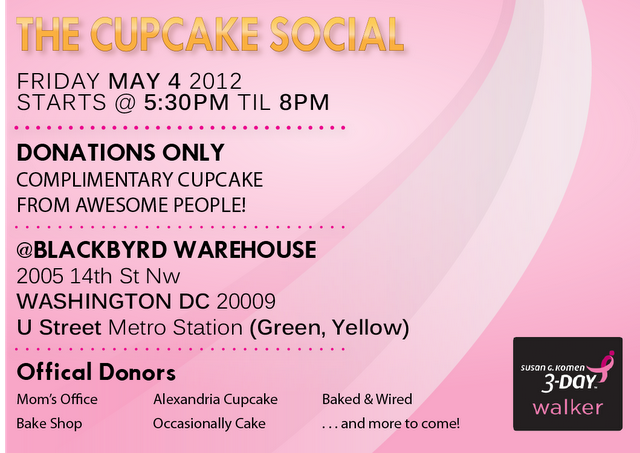 The event will be held Friday, May 4th at Blackbyrd (U Street Corridor, DC) from 5:30pm to 8pm! (Written by Michele) So what sparked The Cupcake Social? Last year, I received some shocking news: my co-worker had breast cancer. No one directly associated to me has ever been diagnosed. The closest I've come was my ex supervisor's mother who had passed away year's prior. It's one of the most widely known forms of cancer yet it didn't touch my world. Until Susan. I wasn't ready to hear something so scary, so personal., so close. We work in the same office. She's the mother of two little girls- I bought scout cookies from them. She constantly has a smile on her face and a light hearted comment to add. I have been fortunate to work with several accomplished women in a male-dominated business and she is one of whom I take notes from. She didn't let us see her fall though. She kept right on going, even after two surgeries. One day, I was irritated in the office and she asked me what was up. I had my tiny rant. And then I realized who I was venting to- a person going through so much is the one listening to my punk @$$ complain. Unbelievable. Some people complain about the attention breast cancer gets... and then I heard Susan say she was not doing this for herself. She was doing it for her daughters' futures. It hadn't occurred to me that they may be in the same jeopardy as their mother one day. There's something very powerful about the love women possess. Maybe that's why this cause gets such passionate support. Hi Guys! The bf recently celebrated 5 years at his current company (good job babe! ), so they gave him $100 to spend on dinner. Since he had no choice but to share his reward with me, we went to Bourbon Steak for a fancy pants date. Located in the swanky Four Seasons Hotel in Georgetown, they have valet parking for around $10. The closest metro is Foggy Bottom on the Orange line. It's so classy in there, but still up to date and sophisticated. Just look at it! They gave us a nice window table, which gave us a bit more privacy. I observed that we were surrounded by more business meeting dinners than dates. All celebrations require a little alcohol! We ordered a glass of Moscato and their French 75 (plymouth, fresh lemon, sugar, served tall with a lemon peel). Both delicious, sweet and refreshing. As we looked over the menu, they brought us a complimentary assortment of fries and sauces. Get this - all fried in duck fat! After placing our order, they brought another complimentary dish! Their truffle bread was yummy and have a nice texture. However, a side of butter would have made it even better. 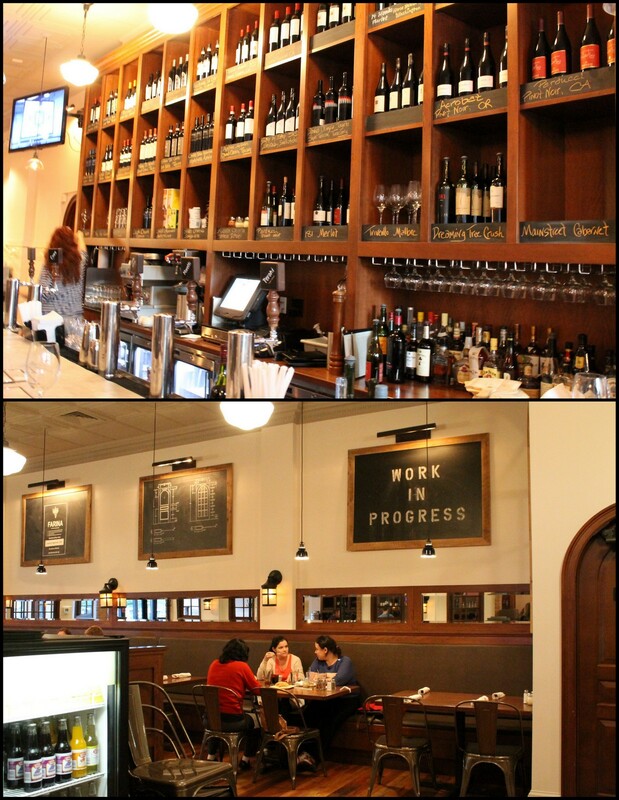 Their menu is like many other steakhouses with appetizers, steaks, other meats and sides. We decided to try their steaks since it is their specialty. LEFT: 10 oz Wagyu Flat Iron ($41) - I ordered this marbleized cut of beef, and thought it was tender. RIGHT: 14 oz Ribeye ($54) - The bf ordered his favorite cut and found it lacked seasoning. TOP: Wood-Roasted "Magical Mushrooms ($10) - I'm not sure what made them magical, but they were cooked just right, and tasted simple. BOTTOM: "Breakfast for Dinner", Egg, Corned Beef Hash ($10) - This reminded us of a Bangers and Mash because the corned beef hash was in the fried mashed potato patties with mustard seeds. We satisfied our sweet tooth with an interesting but beautiful dessert! Brown Sugar Bananas (banana cake, peanut ganache, fried captain crunch ice cream). The captain crunch is what sparked our interest and was used to coat the ice cream. The gold colored blocks were honey jelly, and my favorite part! They love giving complimentary items, and I gladly accept. These tiny Passion Fruit Pops packed so much flavor and cleansed the palate. Overall, I thought the service was professional, found the venue gorgeous and the complimentary items to be a nice perk. The food was good, however not memorable. We like bold flavor, which was lacking in the food. The prices are very expensive, so our expectations were high.